(a) Release the lock and disconnect the transmission wire connector. (b) Disconnect the 2 transmission wire connectors. (c) Separate the connector clamp. (b) Remove upper console panel ( BO-84 ). (c) Remove the 4 bolts and the transfer shift lever boot. Remove the clip and pin and separate the shift control rod. Remove the nut and separate the transfer shift lever rod assembly. 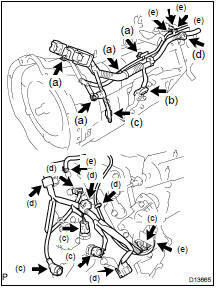 (b) Remove the 3 clamps from the transmission unit and separate the transmission wire. (a) Remove the bolt and the hole plug. (b) Turn the crankshaft to gain access to each bolt. (c) Hold the crankshaft pulley nut with a wrench, and remove the 6 bolts. HINT: At the time of installation, first install the green colored bolt. And then install the other 5 bolts. (a) Loosen the 2 union nuts. (b) Remove the bolt and the clamp. (c) Remove the 2 union nuts and disconnect the 2 oil cooler pipes. Remove the bolt and separate the ground cable. (a) Support the transmission with a jack. (b) Remove the 3 bolts and the transter case protector. (c) Remove the 8 bolts, the 2 nuts and the crossmember. Remove the 4 bolts and the engine mounting insulator RR. HINT: At the time of installation, install the insulator rear with the inscribing mark facing backward. (a) Lower the rear end of the transmission unit. (b) Remove the transmission wire clamp bolt. (c) Remove the 10 bolts and the transmission unit. (b) Release the lock and disconnect the connector. (c) Disconnect the 5 connectors. (d) Separate the 6 connector clamps. (e) Disconnect the 5 hoses and remove the wire harness and the hose.